Not only am I an ice cream person, I am a sour candy junky. Working on a computer most of the day I need my sour watermelon and gummy worm companions. Yes, I am aware how that sounds, but it’s true… if I didn’t have them to nosh on through out the day I would probably not be able to wear anything from my extensive bikini collection. 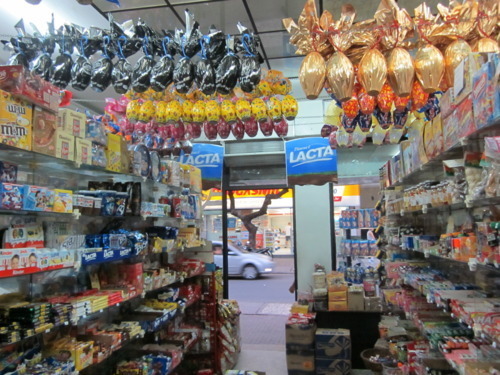 Surprisingly it is shockingly hard to find any candy that isn’t chocolate here in Brazil- they LOVE their chocolates! I have been searching high and low for weeks now…. 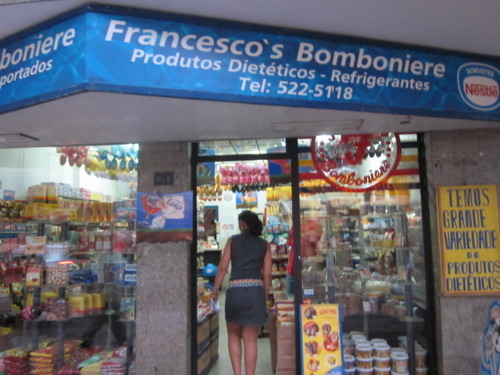 and FINALLY in Ipanema I found a candy store! I was so excited the man probably thought I was a nut when I whipped out my camera. I didn’t care, I found what I had been searching for-sour gummy worms!